Dykebar Hospital opened on 10th April 1909 as the District Asylum for Renfrew Lunacy District. The District comprised of the county of Renfrew, except the burghs of Paisley and Johnstone, which had their own asylum at Riccartsbar : and Greenock, which has its own asylum at Smithston (now Ravenscraig). Mr Abercromby was the architect and when opened the hospital complex consisted of an administrative centre with a hospital wing on each side, 2 villas for men, 2 villas for women, a reception house, superintendent’s house, kitchen, stores, laundry, workshops and mortuary. In 1914 two additional villas, each to accommodate 50 patients, and a nurses’ home were built to relieve overcrowding in the existing quarters. The number of patients was consistently over 300 and the able-bodied men and women were employed in a variety of jobs, for example, on the neighbourhood farm of West-Dykebar, in the grounds, maintaining the buildings, in the kitchen, stores and laundry. From 1916-1919 the hospital was taken over by the military authorities for use as a war hospital and the inmates were removed to other institutions throughout the country, with the exception of a few men to work on the grounds and the farm. During the Second World War patients from Stirling District Asylum at Larbert and Smithston Asylum,Greenock, were transferred to the hospital. 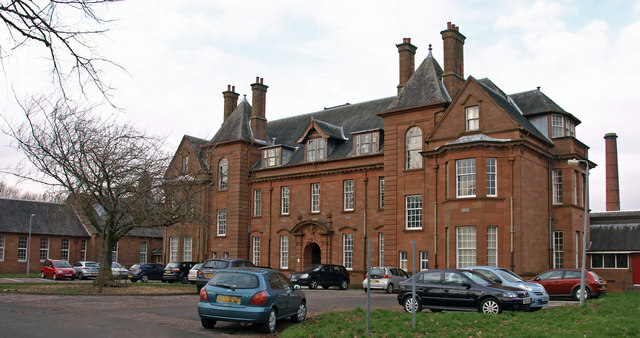 In 1948 the hospital became part of the NHS under the control of Renfrewshire Mental Hospitals Board of Management. In 1964 the name of the Board changed to Dykebar and Associated Hospitals. This Board was dissolved in 1968 and the hospital came under the administrative care of the Board of Management for Paisley and District Hospitals. In 1974 it passed to the control of the Renfrew District of Argyll and Clyde Health Board. In 2005 Argyll &amp: Clyde disbanded and Dykebar now comes within the NHS Greater Glasgow and Clyde Area. From 1948 many improvements have taken place in the hospital, namely the upgrading of the wards and facilities for the patients and staff. In 1975 a new complex was opened which provided more accommodation for psycho-geriatric patients, as well as a recreation hall and dining rooms for patients and staff. In the same year Riccartsbar Hospital closed and all the patients were transferred to Dykebar. As of 2014, Dykebar is the main in-patient facility for treatment for mental health within Renfrewshire. The hospital provides Acute and Continuing Care in-patient services for adults aged 16-65 years of age who suffer mental health problems. It also provides similar in-patient services for the elderly mentally ill.In addition there are out-patient clinics for psychiatry and psychology. There is a day service provision for alcohol problems. The hospital site provides various corporate services.Recently developed is the Dental Department Suite, which will offer dental services to both in and out patients. This facility, recently completed, has been a partnership project with Glasgow Dental Hospital and will be a training facility for dentistry.